A test database has to be configured. The database has to be seeded before the test. After the test the state of the database has to compared with the expected result. Arquillian is a testing platform that allows, among other things, testing Java EE applications in a Java EE application server. The Arquillian Persistence Extension is an extension to Arquillian that takes over seeding the database, matching the state of the database against the expected results and much more. Apache TomEE is a super lightweight open source Java EE application server that is certified for the Java EE Web Profile. This article assumes that you have a basic knowledge of Java EE including JPA and Arquillian. First let’s take a look at the test itself, how it becomes slimmer with the Arquillian Persistence Extension. Afterwards we will explore how to run these tests with the Arquillian Persistence Extension on TomEE. Without the Arquillian Persistence Extension an Arquillian test that creates and updates one entity could look similar to the code below, which looks quite intimidating. For the sake of brevity the invocation of any real business logic is skipped and replaced by direct calls to the EntityManager. The method deploy() prepares the test deployment. There is not much to add besides the entity class and a persistence.xml. We chose an own test-persistence.xml so that we can tell the EntityManager to create the schema itself. We get the EntityManager injected into the test case and we also need a UserTransaction to prepare and check the database in separate transactions. The test shouldCreateEntity() does nothing but creating an entity. Before the test it has to be ensured that the database is clean. Afterwards it has to be checked that this and only this entity is in the database. The test shouldUpdateEntity() updates one entity when two entities are in the database. Before the test the two entities have to be created in the database. After the test the result has to be verified that still two entities exist and one of them has the new value. Noticed how much code is spent on preparation of the database and testing of the results? And in particular testing the results becomes more and more complex the more entities are used or you decide to skip some checks. Now let’s see what the test looks like when we use the Arquillian Persistence Extension. In contrast to the first example it will do seeding of the database, verification of the results and transaction handling automatically for us! The method deploy() prepares the test deployment just the same way as the initial test. We also use the EntityManager in our test, so we get it injected from Arquillian. In contrast to the first test we don’t need a UserTransaction. 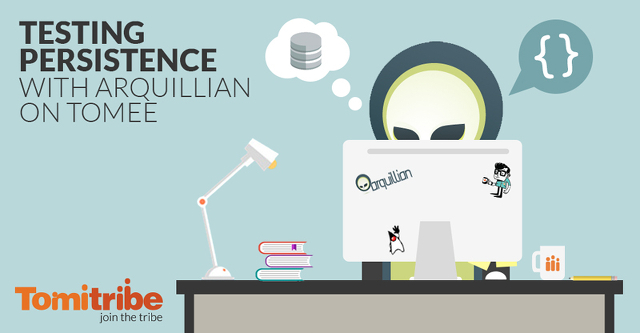 The Arquillian Persistence Extension automatically executes every test in its own transaction. If you look at the test initEntityManager() you actually see a workaround for one of the traps you can step in when using OpenJPA, as is included in TomEE. OpenJPA does not create the schema until the EntityManager is initialized. As the Arquillian Persistence Extension does not use JPA to seed and check the database, we have to ensure that the schema is created before the first “real” persistence test. One way to make OpenJPA create the schema is to invoke the method EntityManager.getMetamodel(). The @InSequence annotation ensures that this test method is invoked first. Notice that you don’t need this if you use Hibernate as your JPA provider. In our first test that creates an entity we don’t seed the database, Arquillian Persistence Extension will automatically clean it for us before every test. We describe the expected outcome of the test in the file datasets/after_create.xml referenced by the annotation @ShouldMatchDataSet. Arquillian Persistence Extension will automatically compare the database contents with this file. We will show the structure of a dataset below. The annotation @InSequence(2) will guarantee that this method is executed after initEntityManager(). In our update test we also define the initial dataset defined in the file datasets/before_update.xml that is referenced by the annotation @UsingDataSet. The datasets mentioned above can be anything that is accepted by DBUnit like XML or JSON. Did you notice how much code just disappeared? The remaining problems we have are executing the tests on the application server and accessing a database from the tests, but first we have to build the project. Next we have to define the dependencies on our testing framework and on Arquillian. We add the awesome new arquillian-universe bom to the dependency management section. This bom ties together the versions of the Arquillian core as well as all standard extensions, including the Persistence Extension. As we use JUnit as our test framework we add a dependency on junit and on the integration for Arquillian in JUnit, arquillian-junit-container. To use the Arquillian Persistence Extension and make sure that the tests are executed in a transaction we add the dependencies on the persistence and transaction extension. Note that we don’t define any versions, as these are already defined by the Arquillian universe bom. The dependency on arquillian-persistence gives access to the database seeding and result matching via the annotations @UsingDataSet and @ShouldMatchDataSet. The dependency on arquillian-transaction-jta allows us to execute the tests within a JTA transaction so that the test does not have to begin and commit transaction itself. The exclusion of the transitive dependency on arquillian-transaction-jta is one specific point to keep in mind. The TomEE Arquillian adapter brings its own implementation of the service brought by this artifact. Unfortunately it can be very hard to diagnose this problem. Finally we add the dependency on the remote TomEE container adapter. What is really awesome about the TomEE container adapter is that you have a remote container, that is started and stopped by Arquillian, but you don’t need to install it anywhere. The container adapter will automatically download the zip, extract it and run the container from there. We have to add a persistence.xml for the test that makes OpenJPA create the database schema, assuming that the default version will not. Then we have to configure the remote TomEE instance so that it can provide the DataSource for the EntityManager as well as for the Arquillian Persistence Extension. As we want to have our tests as lightweight as possible we use an HSQL in memory datasource, so that there is nothing to install or anything that survives two consecutive tests. Fortunately, TomEE already contains the JDBC driver for it in its lib/ directory. Finally we have to tell the Arquillian Persistence Extension how to get a connection to the database for seeding and checking. fooDS is the name of the javax.sql.DataSource the EntityManager wants to use. In TomEE this is simply the name of the resource. Via the property openjpa.jdbc.SynchronizeMappings with the value buildSchema(ForeignKeys=true) we make OpenJPA create the schema at initialization time including creation of foreign key constraints. Via this property we activate logging for OpenJPA so that we can see what it does during the test. The properties in the property “property” of the container element configure the HSQL datasource under the name fooDS. Notice that the lookup name for this resource for the Arquillian Persistence Extension will be openejb:Resource/fooDS. In case you want to debug the application in the server during a test the “debug” property is there to help. It will make the TomEE Arquillian container adapter start the server process waiting for a Debugger on port 5005. The property “defaultDataSource” configures the lookup name of the DataSource that the Arquillian Persistence Extension uses to seed and check the database. This has to be configured appropriately. The extension supports a whole bunch of other properties that have reasonable defaults. You can find a description of all properties at the Arquillian Persistence Extension documentation. Finally you can simply run the test via mvn clean test. Arquillian, Arquillian Persistence Extension and TomEE are a perfect match for testing applications that use persistence. You get a test environment including a database without any prior configuration of the system. Exclude the transitive dependency org.jboss.arquillian.extension:arquillian-transaction-jta. Initialize the EntityManager before the Arquillian Persistence Extension seeds the database the first time. Configure the correct lookup name for the Arquillian Persistence Extension via the defaultDataSource property of the persistence extension configuration section. If you want to have a look at the full sources of this example you can simply clone the project at GitHub. If you want to read more about how much fun testing with Arquillian on TomEE can be you have to read the excellent book Arquillian in Action by Alex Soto Bueno and Jason Porter.